This saddle is for a Martin guitar. These saddle are known as through saddles or long saddles. 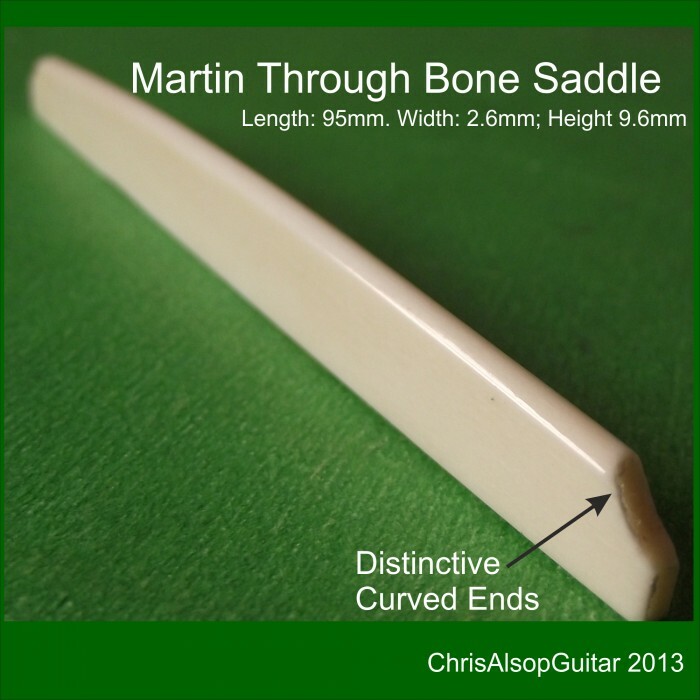 This saddle is hand made from high density Ox bone and is for use on acoustic guitars. These saddles are renowned to give excellent tone, playabilty and instrument projection. We make the parts using precision measurement, precision cutters with careful hand finishing and polishing. An accurate, high quality manufacture results. 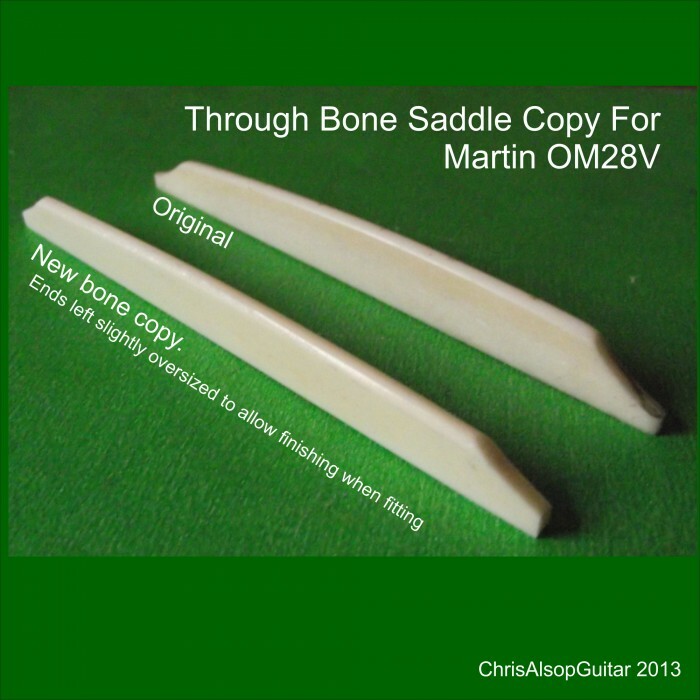 We communicate closely with the buyer to make sure we get the right specification and you receive the full benefit of our knowledge of guitar saddles. The length should fit the saddle slot. The ends can be finished to your specification. Please select the width to ensure a good fit which will benefit the tone. The height of the saddle will determine the action (fret to string distance) - this should be about 2.6mm for low E string at 12th fret and usually a bit lower for high E string at 12th fret. 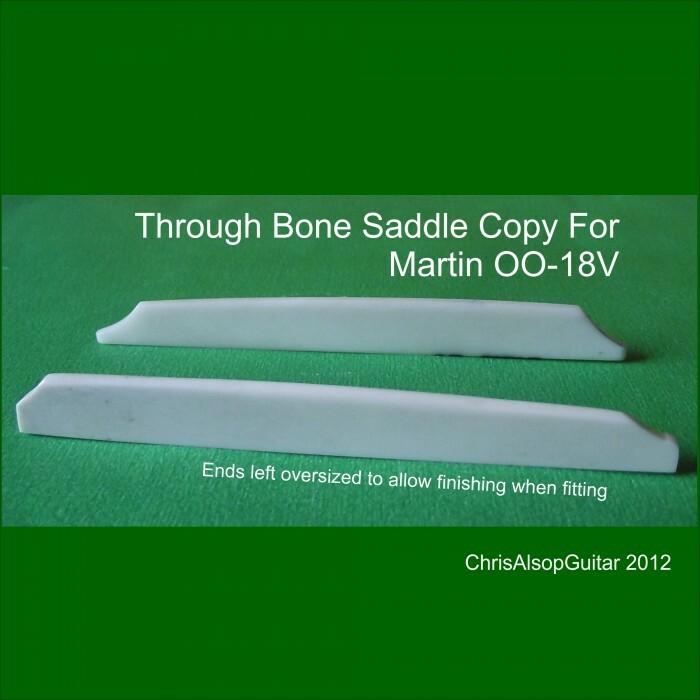 A useful fact is that a change of saddle height by a certain amount - 1mm reduction for example, will make a change of half that amount - so 0.5mm at the 12th fret. The thicker the string the more room it needs to vibrate and so the low E is positioned a little further away from the fretboard compared to high E - the difference is only about 0.5mm at 12 fret which is brought about by a slight change of 1mm to 1.5mm in saddle height from a perfect circle profile - usually saddles can be seen to be a little lower at the high E side.